This is a brand new 6 foot long AV cable. Maximize the clearness and crispness of your TV's resolution. Was able to use em to finally get my N64 working again after a couple of months of just sitting there without a cable group. Thanks a lot! Bad isolation on the cable. Image gets way over exposed. It got here in no time and works perfectly. You can tell the insulation on the cable is a little cheap, but it works well. bought for my N64 , works like it should. I bought this to use with my N64. Item arrived pretty quickly and it works well. No complaints. This was definitely worth the money.Now I’m able to play my gamecube again! I received the A/V cable a day earlier than I was supposed to get it in the mail. It worked fine. Thank you, Lukie Games, I will continue to buy all of my gaming products from only you. I have already recommended your company to my friends and family. 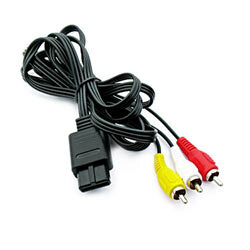 My original SNES console would not connect to my tv/monitor using the original connecting device. This solved that problem. I am enjoying my SNES games again thanks to Lukie Games. Received as promised.. Was a Birthday Gift for my son!! And item works great!! He's enjoying his original Nintendo System which I purchased in the 1990's as a Christmas Gift..
Works perfectly. Super fast shipping.